Maybe it's just me, but Stratford's production of Thornton Wilder's The Matchmaker didn't strike too many sparks. For someone who grew up hearing the tunes from Hello, Dolly! done by everyone from Louis Armstrong to teenagers in high school theatre, it's easy to see why the play, originally called The Merchant of Yonkers (and a flop) in 1938 and then revised at the behest of Stratford's founding director Sir Tyrone Guthrie as The Matchmaker in 1955 and then to London and Broadway, made such a great musical: there's a lot of room for musical numbers in the plot. It's played as a farce with mistaken identities, slamming doors, people hiding under tables; all the usual elements that make plays like Noises Off work so well. But it's also a comedy of manners, poking fun at the conventions of society of the time (the 1890's), and while that kind of play can have great farcical moments -- the screen scene in The School For Scandal is a fine example -- it just seemed to run a little flat in this play. Maybe it's because Mr. Wilder allows for several moments of breaking down the fourth wall and having the characters speak directly to the audience, including Dolly's speech at the end of the play. That has a monumental impact in Our Town, but here it's a little disconcerting. It does not help that the characters are looking back at the people and the play with a hefty helping of cynicism. Tom McCamus, who does characters with his voice the way some do them with their entire body, was Horace Vandergelder, the tightfisted half-a-millionaire. He controls his niece Ermengard (Cara Ricketts) with an iron hand, threatens her intended Ambrose Kemper (Skye Brandon), and terrorizes his employees, the adventure-seeking Cornelius Hackl (Michael Shara) and the shy and overreacting Barnaby Tucker (Josh Epstein). The set-up from the git-go is that he will be defied by everyone, including the title character, Dolly Gallagher Levi (Seana McKenna). Ms. McKenna brings a charm to the part that isn't overpowering, and she reveals some of the vulnerability in Dolly that makes her appealing, but the play really isn't about her; the real matchmaker is Horace. 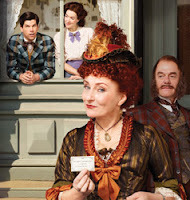 As I noted earlier, it's easy to see how this could be a musical, and if you know Hello Dolly!, you'll hear the cues for the musical numbers that Michael Stewart and Jerry Herman picked up and turned into standards. And there is a musical theme running through this production: the lights in the show come up on Ambrose wistfully singing "The Sidewalks of New York," and that tune is the lietmotif all the way through to the curtain call. And while the song itself is a playful look at a town of long ago, one couldn't help notice that it was done in a slightly acidic tone, as if warning us that adventures can be perilous; even dangerous.